ERISTOFF is a bold spirit with a proud history. Eristoff vodka portfolio includes Eristoff Vodka as well as Eristoff Black (Wild Berry), Eristoff Red (Sloe Berry), Eristoff Gold (Caramel), Eristoff Lime and Eristoff Blood Orange. Eristoff vodka was first produced in the Russian empire in the nineteenth century and is named after the noble Eristhavi family, who created the original recipe in 1806. The Eristhavi family ruled the wild and rugged province called ‘Virshan’ meaning the Land of the Wolf and the iconic wolf still features as a symbol of this heritage on the bell-shaped bottle. The distinctive Eristoff bottle is embossed with the imperial crown, Prince Eristoff’s signature and around its base, written in Russian Cyrillic characters, are the words ‘Original Recipe of 1806’. Eristoff has received many prestigious international awards for its great taste, achieving Gold Medals in the International Spirits Challenge (2013), the Vodka Masters (2013) and the Beverage Testing Institute's International Review of Spirits Competition (2013), for the second consecutive year. 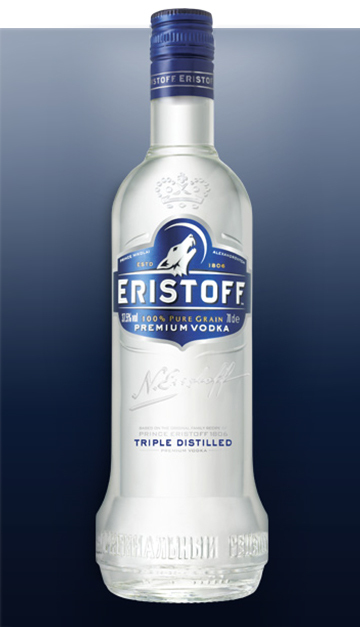 Today Eristoff is one of the fastest-growing vodka brands in the world, with a significant international presence. Eristoff is proud to be acknowledged as the 15th largest international vodka brand* and is available in 59 countries worldwide. 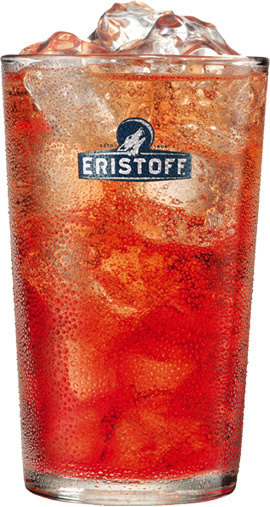 Add ERISTOFF Blood Orange to a highball glass filled with cubed ice. Eristoff vodka still recognises its powerful history of the warrior princes from the Land of the Wolf by featuring the iconic wolf logo on all Eristoff bottles.